There has been some recent comment that life was better in times gone by but is that really the case? Take corruption – it has been around for thousands of years and I fear that it will continue. The only realistic hope is that more serious efforts will be made to reduce the level of it. It is alleged that some miners were a wee bit creative regarding their coal production output but nonetheless they were very courageous to work at a pit in the first place. Certainly there was a core of considerate, kindly Deerness Valley people in generations gone by but on looking at Victorian newspapers I find that plenty of violence occurred in mining communities as well as elsewhere. Likewise there are some considerate and kindly people in the valley today, as well as a few bad apples. Do you agree that one of the problems is the ever increasing emphasis on having possessions rather than quality relationships? It has been said that many people are ambitious but only to the extent that they want to own more that everyone else in their immediate locality. Is excessive capitalism doing us in? Is it dividing us and giving us an inferior set of values? Are we getting to be ‘Go Compare’ automatons? Your past will catch you up. This is a tale that shows that your past will catch up with you from the most unexpected sources. When I was about 14/15 years old I purchased a Diana air rifle for use mostly down the beck. Much against my Mothers wishes God Bless her. Let me emphasise that neither I nor my pals ever used the rifle to kill birds or any other living creature. We used it for target practice using bottles from the Refuse tip which was situated on the other side of the beck from the pump house. The pump house was situated on the New Brancepeth side of the beck and two cast iron pipes left the back of the building and went up the hill and into the ground at the top of the hill. Outside the Pump House jutting out from the bank of the beck were two concrete channels which led into a round brick chamber which was always full of beck water. I can never remember any water being pumped up the hill or the sound of any pumping machinery inside the building. I can only think that this unit was built at the same time as the New Brancepeth Coke ovens at the end of the 19th or the early years of the 20th. century and water at that time was pumped from the beck to cool the coke as the ram pushed the white coke from the oven on to the tram which carried the it up a slight incline where the it was loaded on to railway trucks for onward movement. The Coke Ovens incidentally were built by German engineers and the the first manager was named Schwarz. Am I disgressing a little from my tale. Anyway we lined bottles up on the two pipes and and lay on the grass at the top of the bank and fired at the bottles and that was the main use of the air rifle. Even all those years ago you were not allowed to carry the air rifle in public. To get over the problem of carrying the air rifle from No. 6 Victoria Court down throught the village I used the ingenious method of breaking the rifle (not literally) and sliding it barrel first down through the waistband of my trousers and into my turned down wellies which was the usual footwear for the beck. In my infinite wisdom I thought that no one could see it hidden as it was. I was so wrong. So you see people know your secrets and some day they will catch you up. That is a little industrial history and a little incident in my life. In answer to Brian M, Raich Carter did indeed play for Esh Winning of the Northern League and er…Sunderland, Derby County…..
George Camsell, another famous player of the time, also had a spell with Esh Winning. For the benefit of many Ushaw Moor Facebook fans let me explain that Carter, in his day, was a magnificent footballer; he was captain of the Sunderland football team that won the FA Cup in 1937. Because it was the habit of professional footballers, during WW2 service, to ‘guest’ for the nearest local professional team, Derby County had the benefit of Carter during their 1945 FA Cup win. Its an amazing fact that in the 60s I worked with the brother of the 1945 Cup Final referee, E D Smith. Raich Carter was a fan of Charlie Buchan, another famous footballer; in his time Buchan was as well known as Bobby Charlton. Buchan was known to visit Temperance Terrace to see my great grandfather George Hope – probably because George was a football scout. 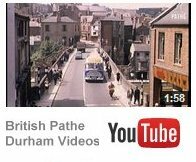 Still I have to be careful of the Cluff police and his agents [tongue/cheek] because this has little to do with Ushaw Moor memories. Clough? Another quite famous football name. Do you agree young man? It is with great sadness that I received the news that Ushaw College is to close this month. The College has been in its present situation since 1808 and as such it very much a part of the history of the local area. The main buildings were built in the 19th century and amongst the architects that designed them were the father and son named Pugin. They were of national renown and designed many churches and buildings in the Victorian era. The farm attached to the College must be unique in the fact that the buildings were designed my one of the Pugins. When I was a boy the College was very well used and boys from the age of eleven years old went to be educated and train for the priesthood in the Catholic Church. There was a junior seminary behind the high stone wall situated near the College farm and the adult students were educated in the area of the College nearest Bearpark. On a Wedneday afternoon large groups of the younger boys could be seen walking through the village in their red blazers and grey trousers. Many of the staff working at the College were from the local villages and it provided employment for many people. My late eldest brother Jim , God Bless him, worked at the College for 12 years as a joiner until his retirement. I went up a few times to see him at his lunch break and he showed me around and at one time the College was a self sufficient unit. It produced its own gas before the arrival of electricity. It had its own bakery, kitchens, tailors, swimming baths, cemetery, infirmary and a large maintenance staff, stonemasons, bricklayers, painters, joiners, etc. The domestic staff were girls from Ireland and the local area. The College has its own unique sporting game named “Cat” I do not know the rules but there was an inter College League and the game was played on a grassed area at the top of the Drive leading up from the Gate nearest Bearpark. There were sports fields on the other side of the road opposite the above mentioned gate and more sports fields in front of the Junior Seminary. The best farmer to work for picking potatoes was Mr. George Dixon who worked the College farm. One shilling an hour, picked up in the morning and dropped off at the end of the working day. A free sack of potatoes delivered to the house plus a couple of turnips a few days after we went back to school. It was back breaking work but you just got on with it. The ride on the trailer to and from the fields would be frowned on today because of health and safety rules but it was a great laugh. I remember Mr. Dixon as a gentleman farmer with a ruddy complexion and wearing plus fours and tweeds and a hat. I also spent many happy hours watching the pigs and piglets in the stys at the side of the road at the front of the farm on Sunday afternoons. No omnibus editions of Corra or Eastenders or even the telly. There is an article in the Journal today about the College library and what will happen to its priceless contents. There are over 44,000 books and manuscripts held in the library, many of the books and manuscripts being hundreds of years old. A treasure trove like this should not be allowed to leave the area. I remember in 1951 there was a huge celebration at the Colllege to commemorate the 1300th anniversary of the birth of the Northumbrian Saint Aidan. Over 100,00 people attended the celebration in the College grounds which was also attended by Cardinal Griffin who was the head of the Catholic Church in England and Wales at that time. I had never seen as many people before and after tea we sat on the wall at the top of the bank above Whitehouse Court counting the buses carrying the people and they were from all over the North East and the North West of England. I can also remember the night of the Coronation of the Queen in June 1953 when they lit the largest bonfire I have ever seen in the field opposite the West gate of the College. It was huge and hundreds of local people attended to enjoy the spectacle. It is time for a nice large whisky. So good night to everyone who might read my article. That is all an entry to The Glittering Prize Competition amounts to. Apart from prestige; let’s not forget prestige. And entertaining us all. I think the old Durham County Council school note books had blue covers and each page had thirty lines, so let us say, on average, ten words to a line x about forty five lines = word count comfortably fulfilled. In the past Brian M has already done his ‘duty’ several times over and if there are no entries to judge he may well end up being offered the Glitter on a well deserved honorary basis! So what will contestants write about? Will it be about the clear and sparkling waters that betrayed the little Broadgate minnows? Or will it be about you smiling at vicar Welby as he passed you by, but not on the other side? Will it be about you catching sight of the Ushaw Moor banner for the very first time? Or will it be an account of the dark forces of school bullying? What about scoring from a penalty for the school team? Were you in the school netball team [hopefully that is one for the ladies] or was your strength, expertise and dishonesty invested in conker competitions? Moving on, were you excited about furnishing your first home or aghast at the insects under your carpet? Maybe your wonderful grandparents or uncle/aunt/parents can inspire enough words. In a little more than two weeks in will be all over and in the meantime the excitement is building. Well it ought to be anyway. Although much of my new blog will have no connection to the Deerness Valley one or two regular followers of the Ushaw Moor site just might be curious enough to have a look at my new venture which is called, strangely enough, Wilfb’s Blog. My intention is to put up one article per month. Many men used to be seen in cloth caps. Old photographs of Sunderland and Newcastle supporters show thousands upon thousands of them in such regulation headgear; if you were adult without a hat you looked out of it. They were especially useful during windy autumn and cold winters. Caps had the advantage of hiding significant hair loss whereas now there are so many men, of all ages, without head hair, much of it by choice. Is it right to say that the ‘new man’ has a bald head and broad strong shoulders?